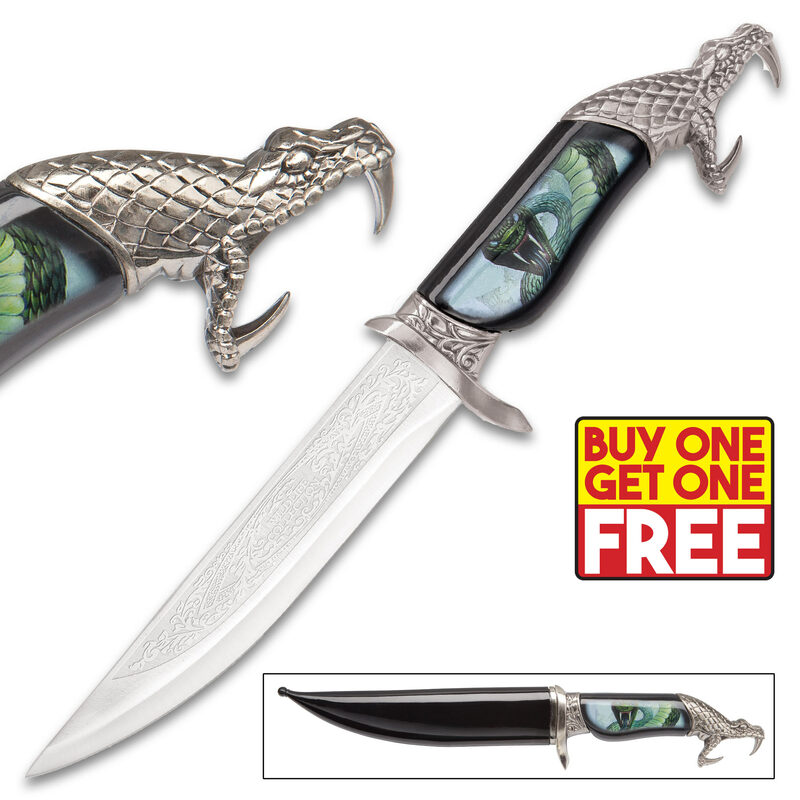 Bush Viper Fantasy Fixed Blade Knife with Polished Black Sheath - BOGO | BUDK.com - Knives & Swords At The Lowest Prices! Like the stunning emerald serpent after which its named, the Bush Viper Fantasy Knife is a mysterious fusion of beauty and menace, allure and dread. While its scaly, jungle-dwelling counterpart uses its radiant color to blend in with its surroundings, the Bush Viper Knife is sure to stand out boldy in any fantasy cutlery collection. This unique fixed blade is carefully crafted with an impeccable attention to detail. Every scale of the sinister snake-head pommel is ideally textured, and the elegant floral pattern adjacent to the guard is rendered in exquisite raised relief. Lovingly painted onto the black handle, a ferocious fantasy version of the real-world Bush Viper glares ominously, its bitter fangs erect and forked tongue flickering. The haunting image is offset by the graceful swirls and stately geometric patterns etched into the stainless steel display-edged blade. Though it includes a polished black sheath, you'll barely use it as - like a serpent baring its fangs for all to fear - you'll want to show off the Bush Viper Knife's remarkably appointed blade at every possible opportunity. Go wild - inject your collection with the fiery venom that only the Bush Viper Fantasy Fixed Blade can deliver and with BOGO, you can give one to a friend! Low cost display knife. Good value for the low cost. Attractive features and blade graphics. o.k as display piece only! This knife was an o.k buy,not the best.There was obvious cosmetic blemishes right out of the box,the viper image on the handle was pretty scratched up and smeared, also there where "stains" on the blade that would not come out. The only reason i did not return it was the blade itself.The art work on the blade was amazing and really detailed! !plus the size of the knife was pretty big and it fit well in my hands and was cool just to "play" around with.So as long as you don't hit anything with it it should be a good display piece. This knife looks good. It makes a good display piece.